Today’s little beauty is Pleurotus eryngii. It apparently also goes under the aliases of king trumpet mushroom, French horn mushroom, king oyster mushroom, king brown mushroom, boletus of the steppes, and trumpet royale. More names than your average international fraudster. Mycologists, it would seem, are even more unable to agree than taxonomists, who as we have seen, are themselves a pretty litigious bunch. 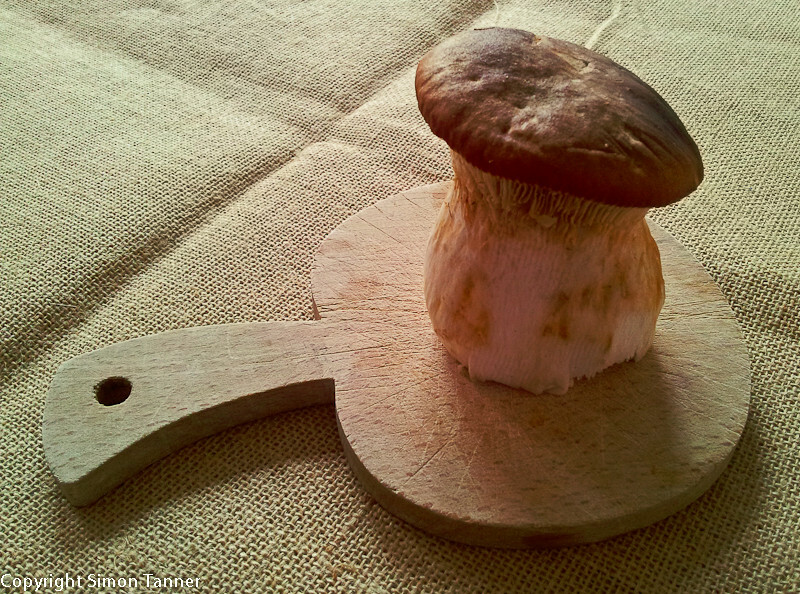 In Italian, it’s cardoncello, but for me it has always and only been known by its Sicilian name, fungo di ferla. It has firm white flesh, which is delicate (fairly bland) when raw, but acquires a deeper flavour when baked, which my experiments proved to be the best option. Way one: mushroom carpaccio. 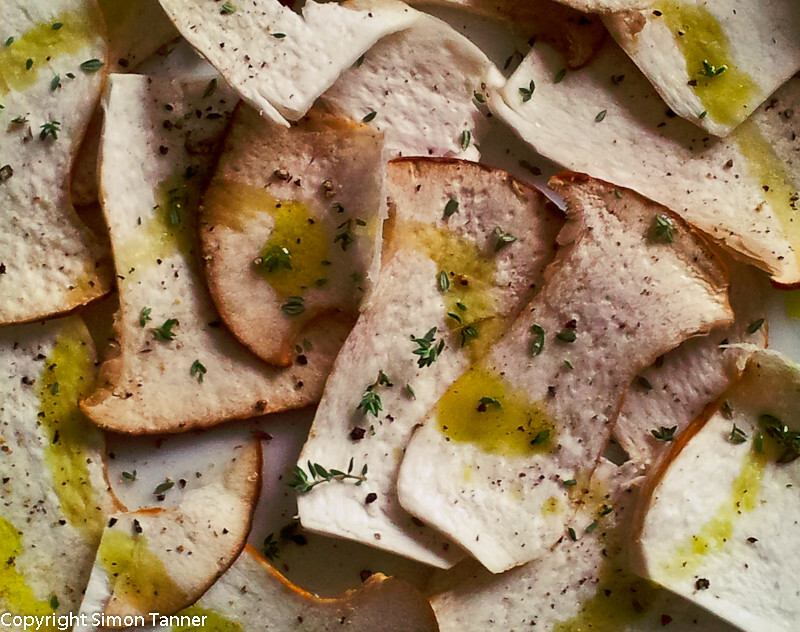 Slice the mushrooms as thinly as you can and dress with good olive oil, and I mean good. The mushrooms when raw have a very delicate taste, and if your oil is below par, you’ll ruin them. Add a squeeze of lemon, some sea salt, freshly ground pepper and fresh thyme, and you’re done. The Italians often use parsley with mushrooms, but it’s not the best combination, I feel, not really thought through. I reckon thyme, with its woody earthiness, goes a lot better. Way one-and-a-half: mushroom, guanciale and truffle ciabatta. Bit of a cheat, since the mushroom carpaccio above is part of the deal, hence the half point. 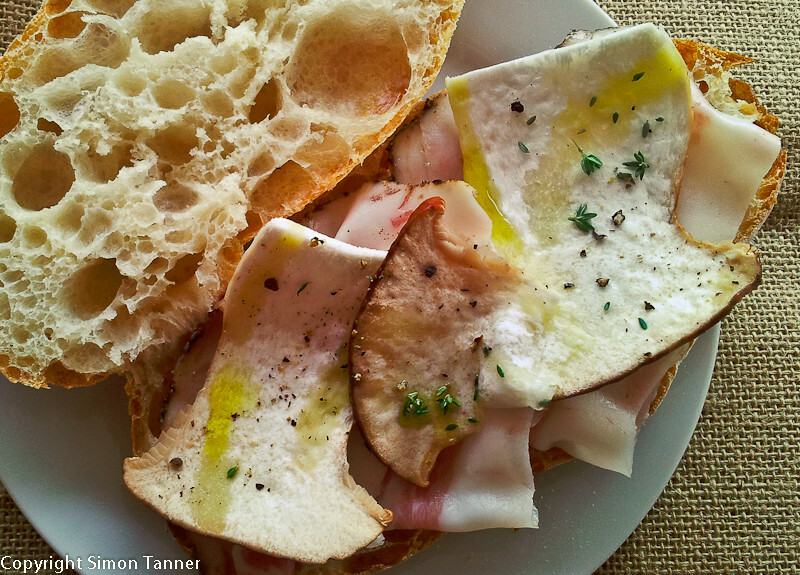 Spread a little truffle sauce or truffle butter (if you’re feeling really extravagant) on a ciabatta, and top with guanciale (mine was from superlative Sicilian suino nero pigs. If you can’t get good guanciale, try prosciutto crudo) and mushroom carpaccio. The addition of some shaved parmesan and/or rocket, with an extra drizzle of olive oil, would also work. 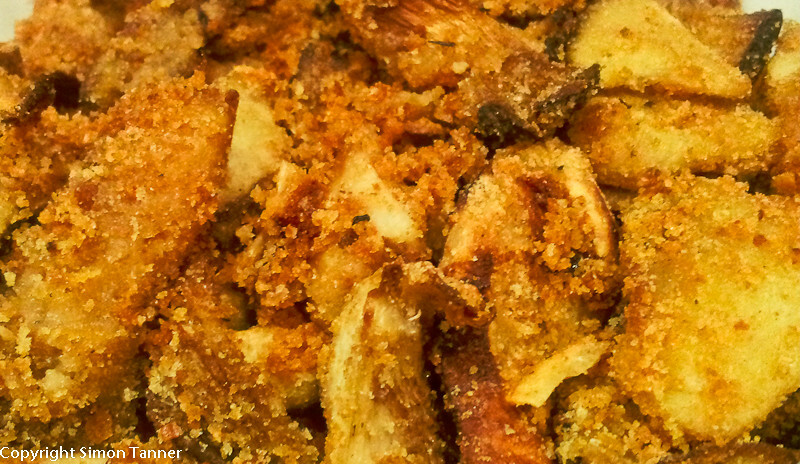 Way three (or, in effect, two-and-a-half): baked breaded mushrooms. Cut or tear your mushrooms up into fairly large pieces and toss well with breadcrumbs, olive oil, salt, fresh thyme and a thinly sliced clove of garlic (I used 100g of breadcrumbs and 4 tablespoons of oil for 500g of mushrooms). Bake in a roasting tin for 20 minutes at 220°C, mixing halfway through to ensure the mushrooms are well coated in breadcrumbs. Serve hot. This entry was posted in Ingredients, Vegetables & side dishes and tagged funghi di ferla, mushrooms, vegetable by hungryenglishman. Bookmark the permalink.